There are your boring style tuxedo shoes and there there are these show stopping orange color stripe tuxedo shoes by Viotti. Viotti has taken your formal wear to whole new level with these sharp looking satin stripe orange tuxedo shoes. 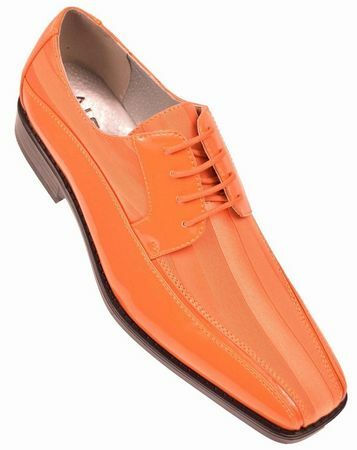 They feature orange patent leather and orange satin fabric to make a tuxedo shoe that is not only sharp looking but will make your black tie event ensemble pop. Shop Online for More Stacy Adams Shoes Here. Don't forget that you'll need a suit to go with your shoes, checkout the latest Slim Fit Suits here. If you are fan of Mens Walking Suits and Outfits, you will be more than pleased with the selection of high fashion Zoot Suits here.